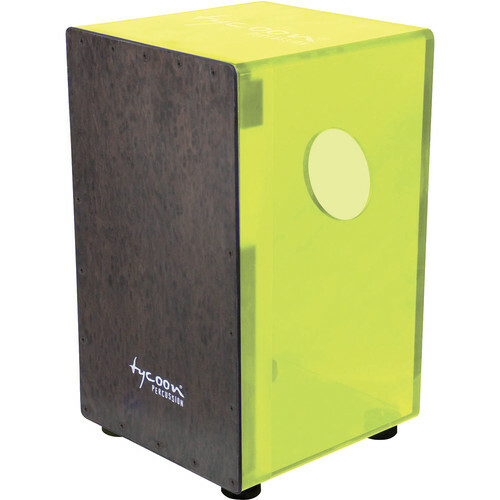 The Neon Green Acrylic Body Black Makah Burl Frontplate Cajon from Tycoon Percussion features a solid body made from clear transparent acrylic to enhance the cajon's superior bass tones and a black makah burl frontplate to provide a distinctive appearance and improved acoustic tonal qualities. The cajon is hand-made and tested to ensure high sound quality. The snare wires are adjustable using the included Allen wrench. A carry bag and stand are available as additional options (sold separately). Box Dimensions (LxWxH) 22.0 x 13.5 x 13.5"